Education in rural India is plagued by many problems. Poor infrastructure, access difficulties, lack of financial support and poor quality of educators are a few of the most pressing of problems.The state and central government is trying to tackle these issues by pumping almost INR 310 billion (approx. USD 5.7 billion) into improving school infrastructure and recruiting teachers. There is also the Right To Education Act enshrining the rights of all children to free and compulsory education. Quality mid-day meals are also attracting students and giving them the fuel they need for learning. These and other initiatives have over the past four years led to the increased enrollment and attendance levels in schools. (97% and 71% respectively, according to the ASER 2012 report ). The big question, however, is whether enrollment and attendance are the right barometer for evaluating the progress of rural Indian education. In the mad search for numbers, has quality been ignored? Are They Learning? A comprehensive survey conducted by the NGO Pratham, called ASER (The Annual Status of Education Report 2012) – which has reached about 3,00,000 households and 7,00,000 children, spanning every rural district in India – has put out interesting and alarming statistics. This is definitely a cause for worry. Rural schools are not only failing existing students, but also poised to fail the 15.8 crore (158 million) children in the age group of 0-6 who are slated to join the ranks of primary school goers in the coming years. The Poverty Effect: Secondly, families in rural India struggle to make ends meet. Their low income is hardly enough to cover daily supplies of food and shelter let alone education. Children are needed to work in fields, which eventually means that they drop out of school, usually after their primary education. A report by UNICEF estimates that there is a 40-percentage point difference in attendance rate between primary (69.4%) and secondary (39.1%) students coming from poor families. Also, more children in the age group of 5-14, whose parents are not educated seem to be opting to go for work instead of staying in school (UNICEF report 2011). Clearly financial stability and awareness of the opportunities provided via a good education are big factor in ensuring continued education in these families. Opportunities. The opportunities for improving rural education are endless. Governments must do their part, but NGOs and private-sector companies will play a vital part as well. 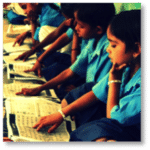 Unitus Ventures (formerly Unitus Seed Fund) has made its first education-sector investment in Hippocampus Learning Centers, a for-profit BoP Startup that’s already improving the education of children across 80 villages in south India. We are actively seeking additional entrepreneurs across India who have plans for scalable and affordable educational services or products that will help India’s children get the education they deserve.